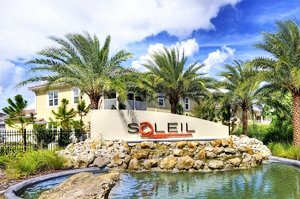 Soleil is a unique gated community consisting of a mix of single family homes and condo units all set on 15 acres of former farmland in south Manatee County. It occupies the block of 8100 27th Street East just off north of the University Parkway corridor which largely defines Manatee’s southern border with Sarasota County. Given its location close to the Manatee–Sarasota boundary, Soleil homes for sale carry a Sarasota address though their neighborhood officially falls under the tax and services jurisdiction of Manatee County. Soleil is a development of leading national builder D.R. Horton which pushed for Manatee County approval on 66 single family homes on Soleil West in early 2015. This phase complements the east phase of the property which D.R. Horton platted for 184 condo units designed as coach homes. Lush preserves surround these Sarasota homes for sale, contributing to the community’s laid-back and quiet setting. Amidst this serene environment, D.R. Horton provided an enticing selection of resort-style amenities for Soleil residents. These facilities include a 4,200-square-foot Mediterranean-themed clubhouse where there is a heated pool with lap lanes and shaded lanai. Soleil’s community center also features a fully equipped health and fitness center, dog park, bocce ball courts, picnic area and grill. Miles of trails within the neighborhood’s perimeter allows safe hours of walking, running or biking. For all these, Soleil has no community development district or (CDD) fees. 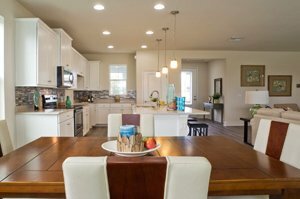 At Soleil West where the community’s single-family homes are located, sales listings typically start from pre-owned three-bedroom homes with floor plans of about 1,844 square feet and asking prices in the high $200s and low $300s. The price quotes level up to the $400s for Soleil homes for sale with floor areas of over 2,000 square feet. Select sales listings at Soleil West back up either to a conservation area or one of the lagoons in the property. Buyers opting for a coach home in Soleil will have a choice on existing condos or newly built units priced in the $200s. These residences are designed with floor areas of between 1,400 and 1,700 square feet designed with two or three bedrooms. Maintenance-included and pet-friendly, these condo units are rentable for a minimum lease length of 7 months twice a year. Notably, Soleil coach homes are next-door neighbors with the luxury apartment complex of The Point of Bella Grove. The Soleil community also shares the neighborhood with the older Serenata condominium which likewise offers resort-style living and mid-rise units roughly at the same price points of Soleil. 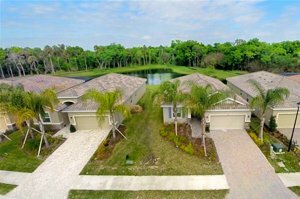 Soleil and its neighbors share a location ideal for home buyers looking for convenient access to all that Manatee and Sarasota counties have to offer. University Parkway just south of these neighborhoods stretches west to the Sarasota–Bradenton International Airport and arterial roads to the Gulf Coast beaches. Towards east, this road corridor leads to the life and leisure delights of the Mall at the University Town Center and the world-class Nathan Benderson Park. Interstate 75 is as easily accessible from Soleil, thus opening to its residents the opportunities to partake of the many lifestyle activities in the downtown districts of both Sarasota and Bradenton. Below are the current real estate listings available at Soleil.